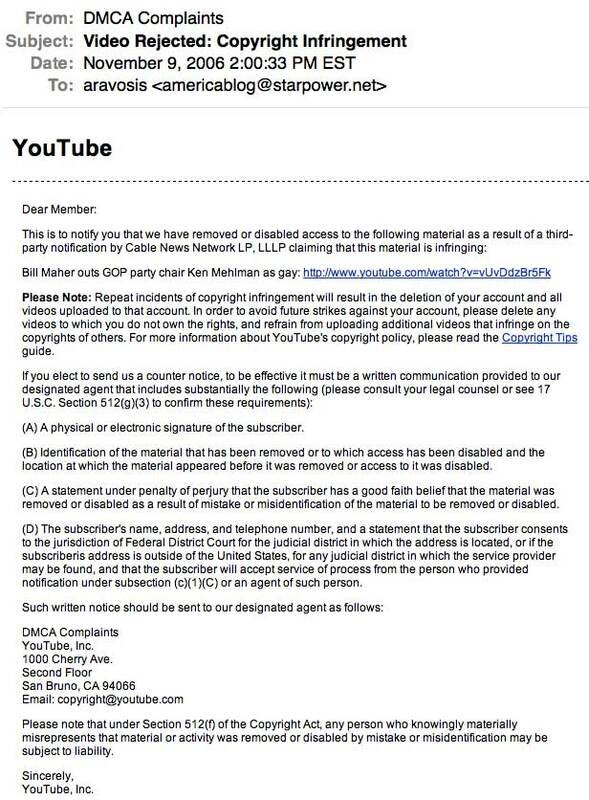 I just got a cease-and-desist letter from YouTube, see below, regarding my CNN footage I posted. The footage, you’ll recall, was from Larry King Live last night in which Bill Maher outed Republican Party chair Ken Mehlman as gay. It seems that CNN has suddenly decided that it no longer wants bloggers, or YouTube, posting any of its video, which is kind of surprising since I always thought we were doing a CNN a favor by constantly touting their network. Apparently I was wrong. NOTE: You can still see the entire video on Huff Post. MAHER: A lot of the chiefs of staff, the people who really run the underpinnings of the Republican Party are gay. I don’t want to mention names, but I will on Friday night. KING: You will Friday night? KING: Great way to close out this segment. It’s poignant. CNN didn’t just edit out the naming of Mehlman as gay, they even edited out Larry’s question, and Maher’s answer, about why gay people sometimes work against their own people. Now why is that question being censored by CNN? 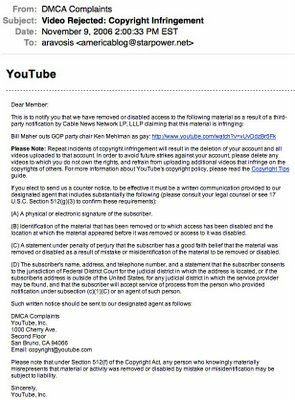 I plan to cut the video back to ten seconds, the crucial part where Bill Maher outs Mehlman, then put it back up (I also still have the 3 meg file, 1 minute 20 seconds long – as do lots of other people, including the Huff Post). I have a law degree from Georgetown and I know intellectual property law as it concerns journalism. You can post an 8 to 10 second video clip as fair use for news purposes, and that is what I plan to do. And if CNN and Google try to close down my YouTube account for using an 8-10 second snippet for news purposes, they’re going to have serious problems.